Mount Rainier Scenic RR is known for its collection of geared logging style locomotives from each of the major builders: Climax, Heisler, Shay, and Willamette. These were built for steep mountain grades and tight curves. We see five locomotives in operation during two visits, including a photo charter with log cars, and with the NRHS 2011 convention special. Steam at Conway - we make a brief October visit to Conway Scenic Railroad in the White Mountains of New Hampshire and capture Canadian National #7470 pulling both passenger and freight trains. 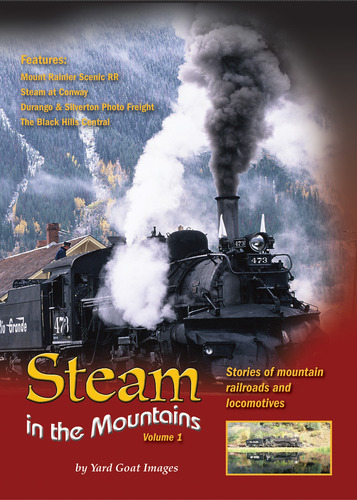 The Black Hills Central - linking Hill City and Keystone South Dakota, this railroad has 4 steam engines and 2 diesels. Our program presents unique locomotive #110, an articulated 2-6-6-2T tank engine built for Weyerhaeuser Timber Co. It is perhaps the loudest locomotive we’ve ever recorded as it climbs Tin Mill Hill!